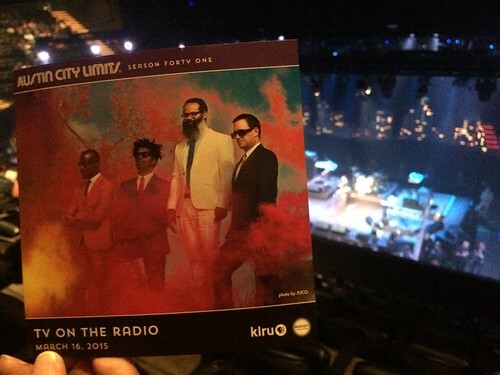 Season 41 of Austin City Limits kicked off this week during SXSW with a performance that streamed live on YouTube from TV On The Radio (henceforth referred to as TVOTR) on Monday. I first became familiar with TVOTR around the time their song “DLZ” was featured in an episode of Breaking Bad near the end of its second season. The series was known for its clever and fitting use of songs as a part of the plot and “DLZ” arguably marks the first sign of Walter White becoming Heisenberg. This was also around the time of the release of their third album, Dear Science which included the song. The single, “Dancing Choose”, got a fairb amount of radio play that year and seems to me to be their breakthrough and biggest selling album. I honestly didn’t fact check that so feel free to let me know if I’ve got that wrong. They performed as a six piece. This was their first appearance on Austin City Limits. The set list is included below and, like most bands, included a significant amount of their new album, Seeds. They did not play “DLZ” but did play “Dancing Choose” and two other songs from Dear Science. They seemed genuinely appreciative of the audience and to be on the show. I’d characterize their songs as a mix of electronic and punk. They had a good energy and the crowd seemed more raucous than usual, probably attributable to SXSW attendees. Either I got on a bad row this time or the entire audience, while energetic, seemed antsy and I had to deal with more than the usual amount of people leaving their seats for the bathroom or drinks or who knows what. I found it distracting and disrespectful. As a note to those who haven’t attended a taping, this isn’t a typical show. You should really try to pace the bathroom and drink trips. In fact, you really shouldn’t leave your seat at all if possible. If you do, try to do it between songs. TVOTR had other appearances during SXSW including the NPR music showcase on Wednesday at Stubb’s.